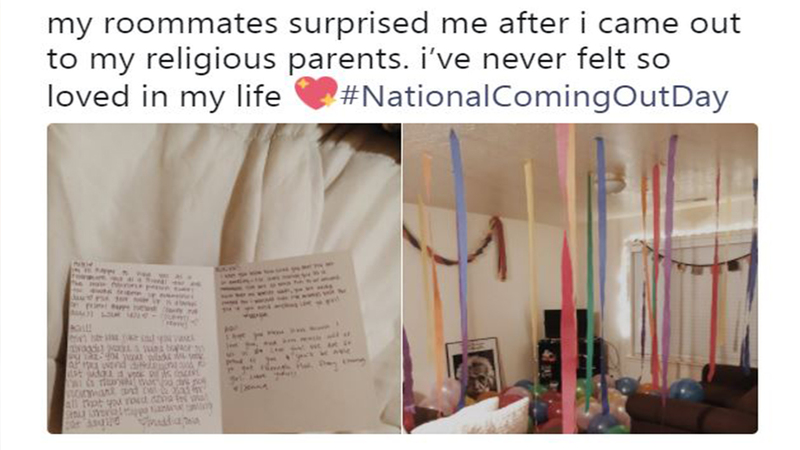 EPHRAIM, Utah (WPVI) -- The sweet gesture of a group of girls at Snow College has gone viral after they decided to surprise their roommate who accidentally came out to her religious parents. On Tuesday, 20-year-old Ashlyn Smith accidentally outed herself to her Mormon parents. She had commented on a Facebook post saying that she "played for both teams" - referring to her bisexuality. Well, that comment showed up on her father's newsfeed, and at first, Smith said he was upset. She said that he asked her to remove the comment, but later called her to discuss her sexuality, assuring her that he will "love her no matter what." While she's relieved they know, Smith said she's hurt she couldn't share this big news with her parents herself. "At first, it felt like the world was coming to an end," she told ABC11. "I just remember crying and not wanting to call and talk to him. I've always wanted to tell them in person, (I) just didn't know how to go about it, so it hurts that it had to be this way, and I couldn't be the one to tell them." After the incident, Smith decided to take a break from social media. "Tonight my parents found out a bit more about my sexuality than I would of liked," she tweeted. "And all of us are struggling at this time. I'm going to be taking a break from social media and my phone for a few days for my own safety and health." After seeing how upset she was, four of her five roommates decided to celebrate that her bisexuality was no longer a secret. So, they decorated their living room with rainbow streamers and balloons and wrote her a card. "I was shocked," Smith said. "I was smiling so big my cheeks hurt. I'm very close with my parents and college is your home away from home, so going through this, I feel alone a majority of the time, especially being two and a half hours away from home. So, coming back to my apartment seeing balloons, cookies, rainbow streamers, and a card filled my heart with so much joy. I needed it, and I'm so thankful for all of them." Smith tweeted about the sweet surprise saying, "My roommates surprised me after I came out to my religious parents. I've never felt so loved in my life." Coincidentally, Smith's accidental coming out coincided with National Coming Out Day, which was celebrated on Wednesday. Smith said she understands that people are afraid to come out - especially if they come from a religious family - but said it's a very liberating feeling. "It's terrifying, but so freeing," she explained. "Once you let those around you who want nothing but happiness for you in your life, it lifts that weight off of your shoulder and you don't have to harbor that anymore. It's bittersweet and different for everyone, but stay optimistic; people aren't always going to say or do the right things, but just know that there is so much more to life than hiding and living a double life." Since going viral - and being shared to Twitter Moments - Smith has been shutting down the trolls on Twitter who are saying that her parents must be "so disappointed" in themselves. "They're actually the happiest they've been in a long time nothing but love and support," Smith tweeted back. Regardless of how they found out, Smith said that she's happy that she can now fully be herself! "A weight has been lifted off my shoulders, thanks to everyone who has sent kind messages the past few days," she tweeted. "My heart is full." As for her relationship with her parents, Smith said she's just taking it one day at a time. "It's been an adjustment," she explained. "It's hard for me not to feel guilty for having these feelings and for putting my family through this massive change. I came home from school late last night and we've just been talking and laughing, a lot of hugging and crying that's for sure. All around, people have responded with nothing but love and support."